GSE’s TPS thickening preparation system gives you extremely smooth, consistent printing paste thickenings – time after time. The system is sturdy and reliable, requires virtually no maintenance and ensures optimum dissolving during blending. You can use it for thickening preparation and storage, as well as for preparation of printing paste and/or mother colours. All types of thickening powders, such as alginates, guars and starches, can be mixed in the TPS preparation tanks. The preparation units are known for their heavy-duty construction and durability, and the use of high quality stainless steel leads to low maintenance and excellent reliability. The unit can be equipped with 1-4 preparation tanks, each with a capacity of 500 or 1000 litres. Efficient blending is guaranteed by the powerful 2-speed emulsifier equipped with a specially shaped turbo type mixing head. 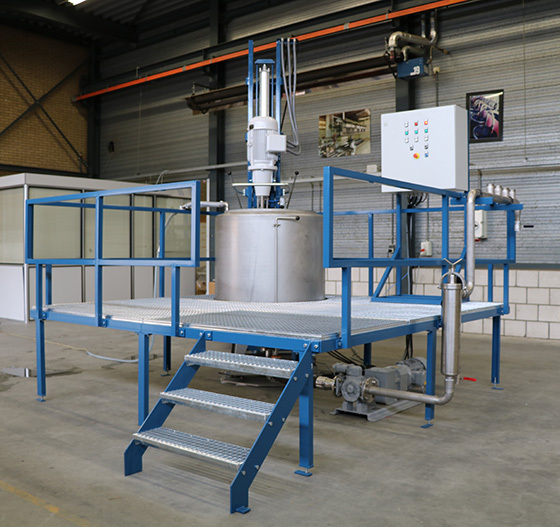 This mixer unit ensures thorough dissolving of the thickening powders. 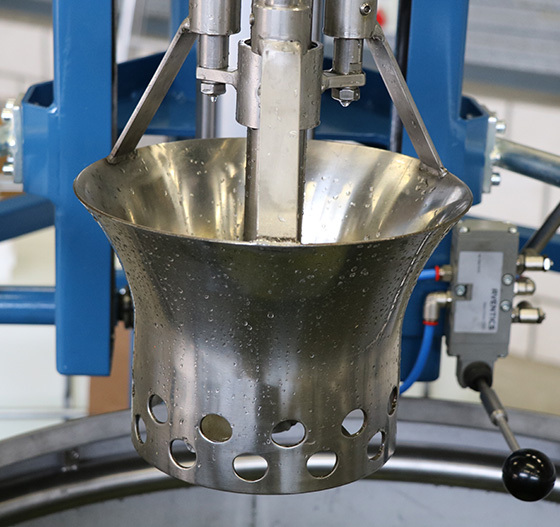 The optional volumetric dispensing unit (VDU) dispenses all liquid components used in the thickening recipe, automatically into the preparation tank. Once mixing is completed, the thickening is pumped from the preparation tank through the distribution manifold into the storage tanks. An inline filter unit ensures that the thickening is clean and lump-free. GSE can provide thickening storage tanks with capacities of 1000, 1500 or 2000 litres with or without scaffolding and staircase. 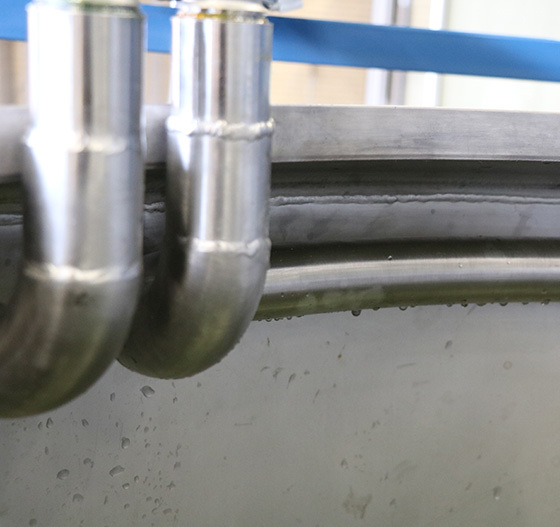 From the storage tanks, the thickening can be pumped automatically to the IPS dispensing system, or it can be removed from the tank using a manually operated dispensing valve. This process, known as paste preparation, is for manual printing paste production or preparation of mother colours used on the IPS (in case of powder dyes). 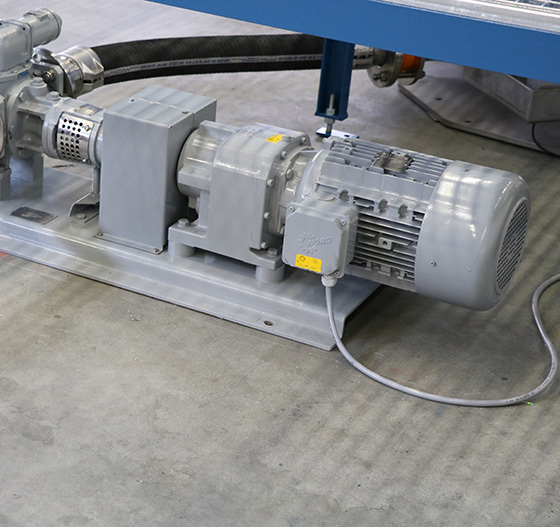 The process is as follows: the drum is placed on the conveyor underneath the manual dispensing valves. 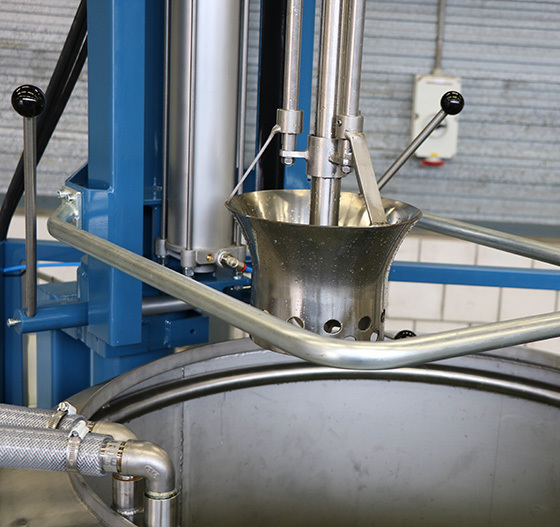 Thickening is removed from the storage tank with the manual dispensing valve and the dyestuff is added. The drum is transported towards the manual mixer. After mixing, the drum is transported to the drum-lifting device. This unit is used to tilt the drum, so the paste pours into the vacuum strainer. After filtering the paste, it can be used for production.